Lie down on the ground (or bench) with your back flat. Bend the knees to about a 45 degree angle. In a smooth, controlled motion, bring the torso up while twisting at the waist until the elbow opposite the knee connects. Slowly lower the torso back down while twisting back to the starting position. Complete one rep per side (Steps 5-6) then switch to opposite orientation. When bringing the torso to the up position, it is normal to have a slight bend to the spine. This can alleviate stress placed on the lower spine. A strong amount of focus comes from this exercise during the hold position. It is often recommended to squeeze the obliques at the top position. For a more intense workout, keep the spine straight and focus on lowering to just short of the ground (but not touching) and then squeezing out the next repetition. Utilizing one's own body weight for exercises allows for greater repetitions. Depending on one’s conditioning, repetition amounts should generally range from 25-100 per set. Do not get into a "rocking" motion with this exercise. The curvature of the spine allows for this happen very easily and sometimes without even thinking about it. Slow and controlled movements are required to properly target the abdominal muscles. While you may be able to do more repetitions in less time when rocking, it defeats the purpose of truly blasting one's abdominals and may cause injury. Often, people will put themselves on insane abdominal routines to achieve the "6-pack" look. 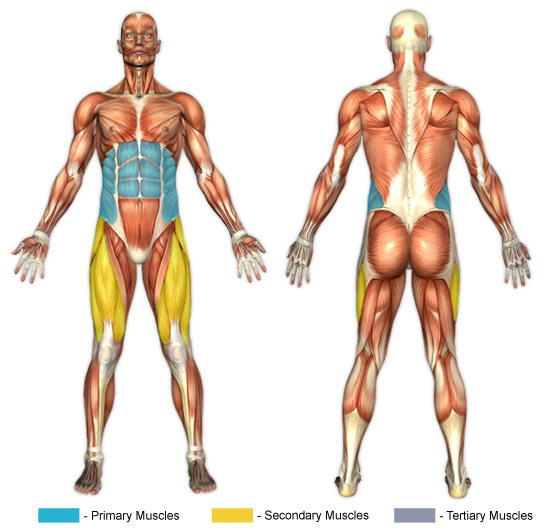 What many fail to realize is that while focusing on increasing abdominal stretch helps the muscles grow larger, the outer lay of fat between the abdominal and skin is what often prevents the “6-pack” from showing. See the Cardio section for more information.